I think if you asked your average Howard Countian, and most assuredly your average Columbian, they would presume that Howard County is a very philanthropic community. Dennis and I used to joke about the "wine-tasting fundraiser circuit" as the foundation of Howard County's social life. Between September and May, that's where you see all your friends...at about $125 a pop. But as President & CEO of the Community Foundation of Howard County Beverly White-Seals noted, in what was later referred as her "call-to-arms" speech, we fall short in this regard. Howard County is a philanthropic community, even in the top tier of counties across the Country. Stand tall, fellow HoCoer's. 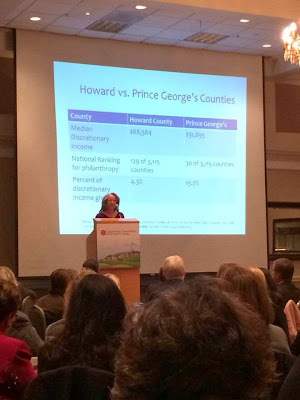 But what's interesting is that we don't match up well compared to some of our neighboring counties, including Prince George's, which is 30th in the Country (out of 3,115 studied). Contrary to what most may presume, philanthropy is not an honor of the wealthy, but moreso a habit of the less well off. Even within our own County, the differences in contributions show Laurel as our most generous neighbors. The below chart is derived from data compiled by the Chronicle of Philanthropy. "D-Income" represents percentage of discretionary income after considering cost of living. Looking at these numbers, I realized that I am not as philanthropic, compared to my neighbors, as I thought I was. Howard County residents give a lot of money to their non-profits and churches. No doubt about that. The question is "How do we stack up?" Looking at the top 50 American cities, we're not even getting invited to the awards ceremony. A warning - your impulse will be to dismiss religious giving and want to look for a separate number for secular contributions. Take a second and ask yourself "why?" For many people, and many communities, the private collection of resources to address the public good is executed nearly exclusively by religious institutions. Some of the loudest and most consistent champions of addressing homelessness in Howard County are our churches. Those contributions are rightfully incorporated here. To paraphrase UMBC President Freeman A. Hrabowski, III, we live in the richest county in the richest state in the richest country in the world. Philanthropy is clearly a priority. Why not strive to be the best? That's all for today. Have a great Friday doing what you love! It's impossible not to.